SIMBUS is the world’s most complete privacy and security management program. Seamlessly sell our entire product line under your companies’ brand and identity. Receive your own payment portal where you set pricing and product descriptions. Use a private SIMBUS dashboard to manage all client relationships and products. Multiple revenue streams – recurring billing, standalone products and consulting. White Label Privacy and Security Software — BECOME A PARTNER TODAY! SIMBUS is first of its kind to offer a white label HIPAA Compliance Branding Solution to 3rd parties. It’s fully automated and has all the powerful features SIMBUS provides. You receive a private dashboard with administrative privileges where you can add your logo and colored header and use our set of policies, procedures, forms and tasks that you offer to your clients. Have your own set of policies, procedures and forms? No problem, we give you access to our powerful backend where you can install your own. We provide access to a powerful shopping cart where you manage products, pricing and memberships. It’s completely separate from our own. Use the carts provided checkout pages or use the powerful API and embed the checkout process into your own website. Cart is full PCI level one compliant giving your clients the highest level of security. 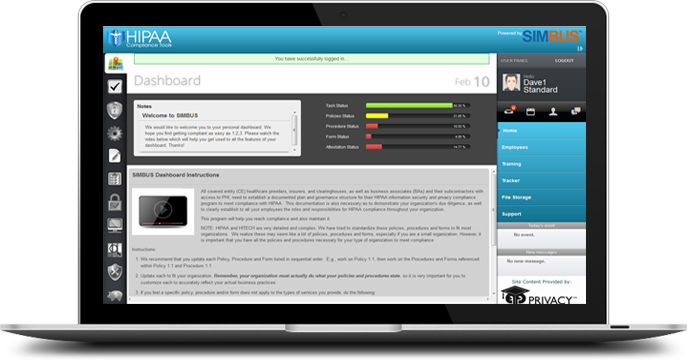 HIPAA Compliance Tools wants you to succeed so we made our license fees very reasonable. We’d like to be able to compare those fees to the industry average but we’re the only company that offers this type of program. Our goal is to provide you with a solid residual income as well as create massive value to your existing customer base. All our policies and procedures are created by 26 year industry expert Rebecca Herold. Rebecca needs no introduction but in case you haven’t heard of here, she has worked for companies like Disney, ISACA, NIST, Johnson and Johnson to name a few. She has translated the cumbersome HIPAA Law into easily readable policies and procedures. Your job is finding new customers and ours is to provide those customers and you as a brand with expert support. We handle everything for you including memberships, billing, card cancellations and product upgrades. We also provide your valued members with expert support through internal ticketing and a full moderated support Forum. Your success is our success. We provide you with our library of marketing materials so you don’t have to reinvent the wheel. Use our brochures, banners, email templates and our giveaways to provide value to your prospects. We even have coupon codes, and the ultra modern QC bar codes. All professionally created, all for you. We’re here to help! SIMBUS Brand is nothing like you’ve ever seen! Finally your company, association, law firm or virtually anyone looking to add products and services to their product line can now have a HIPAA Compliance Solution for HIPAA Compliance that is branded to your organization. We supply you with everything you need to add value to your existing clients. We manage memberships, payments, cancellations, billing, all policies, procedures and forms and give you admin access to view your clients, add new clients, send notifications, use internal email and fully manage your account. Build a solid residual income and create value to your existing business. Law Firms, Large Groups, Associations, Non-Profits, Insurance Companies, Health Care Agencies or anyone who has a large database of prospects who need to be HIPAA Compliant. Our affiliate program is the easiest way to partner with HIPAA Compliance Tools. Simply fill out an application and get access to a personal dashboard where you will be given access to all our marketing materials. Use a code to drive traffic to our site and when someone purchases a product or service, we send you a check. It’s that simple. SIMBUS Brand is a White Label HIPAA Solution allowing partners to sell products and services under their own identity for a share in revenue. Partners receive a private dashboard and shopping cart and from there manage their own clients. Partners have access to all products and services from HIPAA Compliance Tools. Have your own policies and procedures? We provide a blank version of SIMBUS giving you the flexibility to add your own content. Add policies, procedures, forms and tasks and push them to your clients under your own identity. We also give you full access to sell our other products and services. Full support is included. SIMBUS is priced to be extremely affordable but don’t let the low price fool you. There is no single product on the market that combines this many features in 1 single platform. HIPAA Compliance Tools has become SIMBUS. Please click the link below to be directed to our White Label Pricing page on our new site. Thanks! So far SIMBUS seems to have everything I need. Policies, procedures, forms, tasks, audit management, breach management and the ability to add users is a cool feature. If I can think of anything else I need, I’ll let you know. In one word GREAT! I like look and feel of the software. The policies, procedures and forms are clean and easy to manage plus the functionality of the site makes it fun. Thanks. For a new software program, this has been great. Usually there’s issues when software is new and so far the program has worked very well. We plan on getting compliant and maintaining compliance with SIMBUS. Dave so far its been great! I think this may be a game changer for the industry. Keep up the good work! SIMBUS is the only product of its kind that offers this many tools in one easy to manage platform. Never has there been a more comprehensive compliance solution offered at this price. SIMBUS saves time by having all needed compliance tools in one convenient location. SIMBUS is complete yet very affordable. Easily manage monthly payments. By using SIMBUS, you can drastically reduce your risk for an Audit or Breach. By maintaining compliance, SIMBUS not only helps avoid audits it helps you pass one. Bottom line, SIMBUS is good for your business and insures you protect critical PHI. By getting and maintaining compliance, SIMBUS will help avoid costly breaches. The training in SIMBUS will keep employees educated and up to date on HIPAA. CEs are now responsible for managing Vendors. SIMBUS takes care of that process. No other program manages all areas of HIPAA compliance in one easy solution.